So after a little investigative sniffing in Mama J’s shopping bag on my part, which was promptly taken upstairs and hidden in the depths of Mama J’s wardrobe, I was finally allowed to play with my birthday presents on Wednesday morning. I squeaked my two new toys and chomped on my set of Nylabones until my heart was content, which was all of about two minutes when all I wanted to play with was Mama J’s nylon Scottie dog shopping bag. Yes, folks I was “that” child at Christmas who you give all the high tech toys in the world to and they just want to play with the cardboard box and wrapping paper that they came in. Granny tussled with me and namely my mouth but I wanted that bag. I don’t know whether it provoked me with it being another dog (albeit a material pooch) or whether I wanted to play shop but Mama J was not cheering me on in my quest for shopping bag supremacy at all. She turned all stern and Grandma-esque and shouted, “Elsie leave my shopping bag alone!” Then she turned to Granny in a childlike manner and squealed, “Make her stop!” Granny eventually managed to wrestle the bag from my now unhappy shopper mouth and hid it safely back in Mama J’s handbag. I was then distracted by Grandpa who beckoned me to play with one of my new toys again. I spent the rest of my birthday eating wonderful things like cheese and biscuits and my new edible treats that Mama J also bought me and my day was rounded off with a bath/shower with my new lavender conditioning shampoo. Once I had dried off fully my family were so impressed with my glossy and aromatic smelling coat that I think they may enter me into every competition going to win a hair commercial. I don’t think it’ll matter that I’m a dog as you can’t discriminate on anything nowadays. I’ll even go as far as to say that I believe Mama J has designs on my new shampoo as she keeps stroking me in wonderment. So if it grows legs and feet and goes walkabout, her shower is the first place I’ll be looking and Mama J’s hair will be the first thing I’ll be sniffing. You have been warned Mama J, get your own shampoo! Mama J and I each had a day of it on Friday, she chased a man and I chased a Squirrel (again on both accounts). Firstly I’ll tell you Mama J’s story. Now this is a work related tale which Mama J doesn’t always like me writing about. Although Mama J could write a blockbuster book all about the rigours of modern retail, it maybe a tale more akin to the card game Patience and the children’s game of Frustration. Mama J, her lovely colleague and a member of staff from a neighbouring store saw an elderly gentleman on the store’s electric scooter go whizzing by them towards the doors. Mama J gave the man the benefit of the doubt and thought he might stop just shy of the exit, but oh no he kept going out into the car park. Mama J decided action needed to be taken (bellowing music if you please) as customers aren’t allowed to ride the store’s electric scooters in the car park due to insurance protocol. Mama J ran like a cross between Davina McCall in her Channel 4 dating programme Streetmate and Investigative Reporter Donal McIntyre (when he was a serious Journalist prior to his Dancing On Ice sequin clad appearances) after this speeding man. She caught him up around the corner and heading towards the disabled parking bays and started calling out like a school Head Mistress, “STOP! You can’t take the scooters out into the car park as we aren’t insured if you hit a car or run over a person.” The gentleman argued that the front pavement area wasn’t the car park and threatened to tell the companies former owner of his Mart Cart woes. Once the man’s shopping and himself were safely in his car, Mama J got on the now wet (it was pouring down with rain) scooter seat and realised (another bellowing musical moment here) that it was the new Mart Cart and Mama J didn’t do too well driving it (she nearly crashed into the Newspaper stand) last time she tried manoeuvring it. Once she realised how to start it up and her sensible colleague (who by the way had never driven it before) instructed her how to go forwards and then backwards, Mama J turned it slowly around and was then off speeding back around the side of the building and back inside like a mix between new Top Gear Presenter Sabine Schmitz (minus her rasping German accent) and Madge off Benidorm (minus her Perma-tanned complexion and chain smoking). 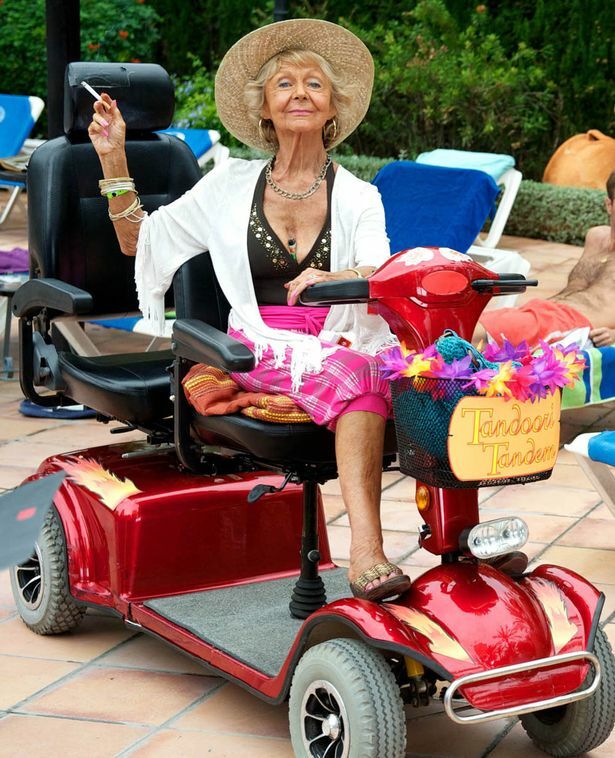 If Top Gear did ever want to do a feature on rally driving electric scooters around a store/car park Mama J’s up for the challenge. When she got back inside a customer informed her that everybody was looking for her and her colleague who had a queue by this point said she’d been telling customers that Mama J had been, “Chasing a man down the car park!” What a hussy Mama J is and we better make that a hussy with a wet bum from riding the scooter back into the store. Oh the glamour! Shame the man didn’t look like David Gandy but Mama J got to have a spin and you can’t have everything in life can you? Now I hope I’m not going to get too repetitive here (I realise I mentioned nature’s wonders the other week) but I must tell you about my Squirrel encounters last week. I had three sightings whilst out with Grandpa on our morning stroll on Friday but then one of the little buggers really upped the anti by visiting my garden’s railings. This happened first on Tuesday morning when Mama J came back in from making a cup of tea to be greeted by a Rat… Oh no it had a bushy tail…. A Squirrel then, Mama J clearly needs to start paying more attention next time Chris Packham is speaking on the television! She went to try and get her phone to take a photo but distracted both the Squirrel and myself from our slumbers. I missed the Squirrel on this occasion but it was bolder on Friday morning and I was more on high alert following my encounters of a Squirrel kind on my walk. I was on the sofa arm ready to pounce and Granny was set to move the ornaments from the window sill should I make such a move. Good job they aren’t from the Ming vase collection with me around. Lastly I must finish with the news that I have been linked with a children’s television series. 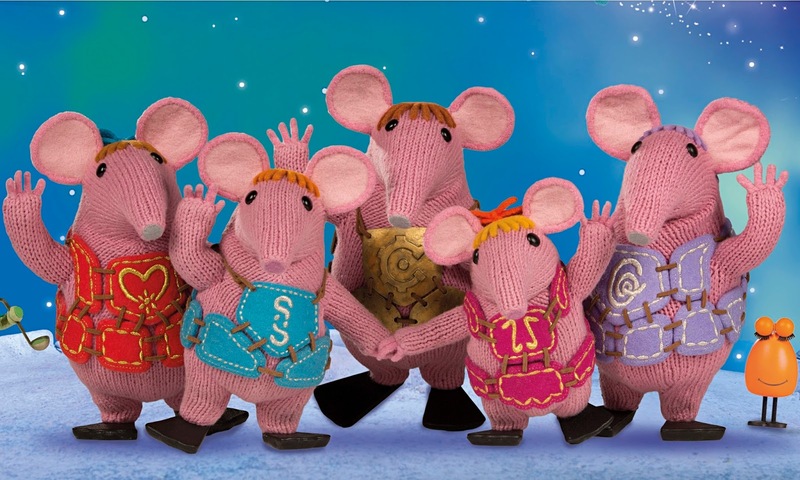 A very good family friend reckons I would make a very good Clanger’s character. As they have beautiful pointy noses, sticking up ears and make a, “Cooing!” noise. Mama J has been watching episodes on YouTube to see what our friend was insinuating. She quite enjoyed them, (well I’ve always said she had childlike qualities about her) and could see the resemblance. The final thing I’ve got to ask is, “Where do I sign?” to join the cast. So much excitement in your house, Elsie! I bet you would of BOL to see Mama J chasing down that motor scooter! How rude of them to take the nylon bag away though! It was YOUR birthday. It was fair game! I hope you loudly and clearly told them what you thought about that!